Joseph of Arimathea is believed to have buried the Holy Grail at the foot of the Glastonbury Tor. 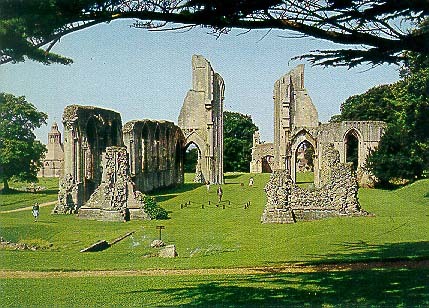 On the site of the Abbey (above), he is supposed to have built the first Christian Church in Britain. 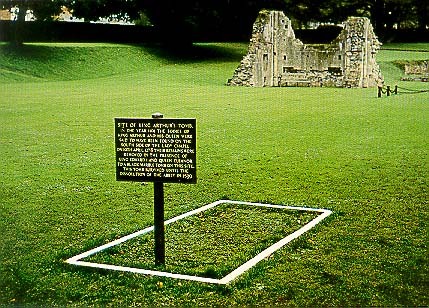 This is also said to be the site of King Arthur's Tomb. The sign reads: "In the Year 1101, the bodies of King Arthur and his Queen were said to have been found on the South Side of the Lady Chapel. On 10th April 1278, their remains were removed in the presence of King Edward I and Queen Eleanor to a black marble tomb on this site. This tomb survived until the dissolution of the Abbey in 1539."